Mix crumbled cornbread, stuffing, sage, eggs, celery, onion, pepper, salt and 1 can of cream of chicken soup which has been diluted with 1 can of chicken broth. Spread 1/2 can of undiluted cream of chicken soup in bottom of crock pot. 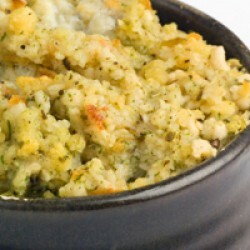 Layer with cornbread stuffing mix and layer with chicken. Repeat layers trying to end with chicken on top.